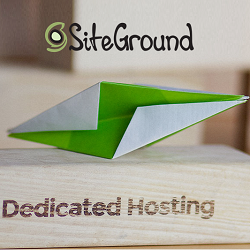 SiteGround was founded in 2004 by few university friends, SiteGround gradually but steadily turned into a leading web hosting service provider. With only a handful of people working from their university dorm rooms in the beginning, today the company has more than 280 employees and is constantly growing. They have been for more than 12 years on the market and run 3 different data centers across the world – USA, Europe and Asia-Pacific region. There are more than 4,50,000 domains hosted with SiteGround. They process 1500+ tickets, 800+ phone calls and 2000+ chat requests per day. They have built in-house technologies to minimize downtime, for outstanding website speed, for better security and to provide the fastest customer service across the web hosting industry. 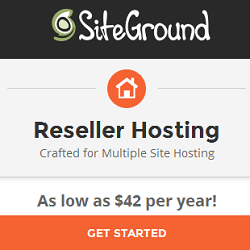 SiteGround is one of the best web hosting provider and highly recommended by many pro-bloggers, webmasters and WordPress.org. They have built in-house technologies to minimize downtime, outstanding website speed, better security and fastest customer service across the web hosting industry. 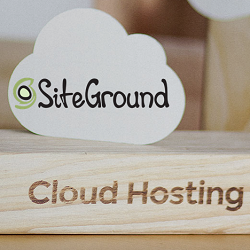 SiteGround was founded in 2004 by few university friends and now it’s a leading web hosting provider. Today the company has more than 400 employees and is constantly growing. There are more than 1,000,000 domains hosted with SiteGround. They process 1500+ tickets, 1000+ phone calls & 3000+ chat requests per day. They have been for more than 14 years on the market and run 4 different data centers across the world – USA, Europe and Asia-Pacific region. Every web hosting company has it’s own pros and cons. Before making a decision, you should know everything about web hosting provider. Let’s see the pros and cons of SiteGround web hosting. Multiple Data Centers – SiteGround has 4 data centers in three continents. You can choose the closest data center to host your website for the best loading times. Super Fast Speed -SiteGround provides SSD drives for a 1000x increase in input/output operations as compared to regular drives. Free CDN – Their free CloudFlare CDN makes your website load faster and CDN delivers the content much faster from the closest data center. They use NGINX web server technology to speed up the load of the static content. Free SSL Certificates – They provide free and automated Let’s Encrypt SSL certificates for all domains hosted on shared hosting plans. Free Auto Daily Backups – They provide free auto backup on a daily basis for up to 30 days back. In case of emergency, you can easily restore your website, email or files with a few easy clicks. 24/7 Customer Support – Their 24/7 customer support is awesome. They have zero wait time for Live Chat and Phone support. If you raise a ticket, you get first reply in 10 minutes. They consistently achieve nearly 100% customer satisfaction rates. You will love their support. 30 Days Refund Policy -They have a 30 day money back guarantee for all shared hosting plans. Fixed Storage -Their plans come with fixed storage. They offer 10GB with startup, 20GB with GrowBig and 30GB with GoGeek which is more than enough. A regular WordPress blog doesn’t require more than 2-3 GB disk space. Setup Fee for 1 Month Trial – If you choose 1 month trial billing, then there is a $24.95 setup fee. But if you signup for longer period like 12, 24 or 36 months, then you will get bigger discount with no additional setup fee. If you have make up your mind to buy SiteGround, click here to get 67% discount on shared hosting plans. Let’s have a look on SiteGround’s Technology, Data Centers, Server Uptime and Software’s used to minimize downtime. Speed is the heart of any website. If your website loads slower, people left the website very soon. To avoid this, SiteGround uses hottest speed technologies. To make your website faster, they always work on faster hardware, an innovative network architecture and new software solution. SSD Drives – They use 1000x faster hardware to increase input/output operations. NGINX – They use NGINX web server technology to speed up the load of the static content of all the websites we host. SuperCacher – SiteGround has built their own caching mechanism based on NGINX reverse proxy. Their SuperCacher also allows website speed optimization through memcached. Free CDN – Their free Cloudflare CDN makes your website load faster in any part of the world by caching its content and distributing it over multiple data centers. When foreign visitors access your website, their CDN delivers the content much faster from the data center closest to them. HTTP/2 Enabled Servers – SiteGround is the first web host to support HTTP/2 network protocol on all servers. HTTP/2 significantly speeds up loading of websites in the browser. PHP7 – PHP7 is known for its great speed benefits. Whenever a technology or update is introduced, that makes php executions faster. SiteGround has 4 data centers on three continents: USA, Europe and Asia-Pacific region. All Data centers have High-end Physical Security, 24×7 human security, biometrics, access control man traps, bullet proof lobbies and video surveillance are only some of the security measures applied. 100% dedication of SiteGround system administrating teams pays off with great up-time. In addition, their unique downtime prevention software helps to minimize downtime. SiteGround has created unique downtime prevention software that not only monitors each server’s status in real-time but also resolves more than 90% of server performance issues instantly with zero human interaction. 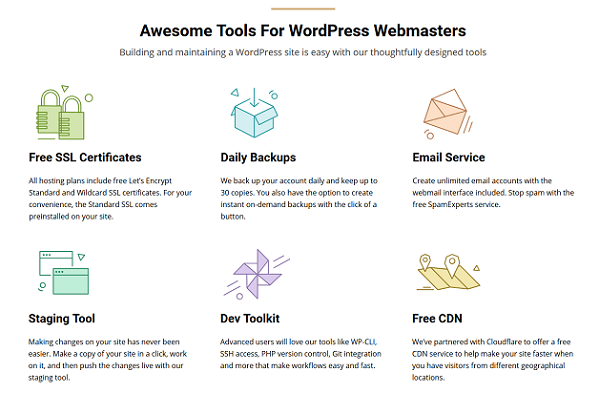 SiteGround provides 1-Click Installer to launch your website, SuperCacher for ultra-fast site and WordPress Staging for easily test and deploy any changes on your website. SiteGround offers different type of hosting plans like shared hosting, WordPress hosting, cloud hosting, and dedicated hosting. If you are a newbie and just starting out, then shared hosting is the best fit for you. Whenever you think, your website is not able to cater huge traffic, you can upgrade to higher plan. Let’s check out SiteGround’s different hosting plans. Shared hosting – Shared hosting is suitable for low traffic websites and highly recommended for newbie or new websites. In shared hosting, server resources are shared with other websites hosted on that server. WordPress hosting – This plan is WordPress optimized version of their shared hosting plan. It comes with SiteGround’s in-house WordPress optimizations methodology to improve performance of your website. Cloud hosting – Cloud hosting is a flexible upgrade to shared hosting. It allows you to use resources of multiple servers on a cloud architecture. It is suitable for growing websites, popular blogs, or businesses. Dedicated servers – Dedicated servers give you a complete server for your website. It is more expensive but gives you a lot more power. The downside is that you will have to manage the server yourself. Reseller Hosting – SiteGround’s reseller hosting program is created for web designers and developers to maintain their customers’ websites on a long term basis. Enterprise hosting – This plan is for large businesses and high traffic websites with challenging server requirements. You will need to get in touch with SiteGround team and they will create a tailor-made plan to suit your needs. Conclusion: Is SiteGround the Right Choice for You? I hope this in-depth SiteGround Review helped you to understand SiteGround in a better way. I have tried to tell you everything about SiteGround to clear all your confusions. if you are still confused about SiteGround, then I must say you should concentrate only one thing first i.e. Service & Support. If you want fast and reliable web hosting service with great customer support, then SiteGround is perfect for you. They have hosting plans for every budget and each plan comes with great set of features. All their shared hosting plans include 1-click WordPress installer, free migration, SSD storage, Let’s Encrypt free SSL and Cloudflare CDN service. If you are just starting your first dream website, then go with SiteGround and avail 67% discount on Shared/WordPress hosting plans. What do you think about Performance, Reliability and Support of SiteGround? Rate SiteGround Hosting and comment below. If you liked this post, rate below and share your experience in comment section.